Screenplay by Dan Gilroy, Max Borenstein, and Derek Connolly. Besides eating out dinner out for our 40th anniversary, my husband and I decided to go see Kong: Skull Island. The basics about Kong first begin in 1944, in the South Pacific during WWII when two planes are shot own on the beaches of the island. Survivors, American pilot Hank Marlow (Will Brittian) and Japanese pilot (complete with a katana! ), Gunpei Ikari (Miyavi), set out fighting and chasing each other deeper into the interior. They are interrupted by a giant gorilla. Fast forward to 1973, there is this organization called Monarch looking to prove that ancient species are returning to maybe take back the earth from us humans. One of these people, Bill Randa (acted by John Goodman), puts together a team of U.S. Army soldiers (the Sky devils), led by Preston Packard (Samuel Jackson), two of his own experts, San and Houston Brooks, a former British Special Air Service captain renowned for his tracking abilities, James Conrad (Tom Hiddleston), and a war photographer (Brie Larson) who applied to join them. They head out on a ship for a mysterious island shaped like a skull. Once there, they run into a gigantic gorilla, Kong, and immediately out of fear, they shoot at him. You know where this is going—big mistake on their part! 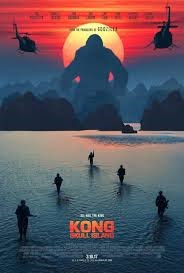 Then they meet Hank Marlow (now much older and acted by John C. Reilly) and a tribe of painted people who live on the island, protected by Kong from the monstrous skull crawlers—as Hank calls them. From there, it’s all about finding the other survivors and escaping the island. After the movie ends, don’t leave the theater, but stay until after the credits end, for a special piece, that appears to lead to the next film in this series (like Marvel does), Godzilla 2. Kong: Skull Island is a roller-coaster of a monster film that takes you back to those giant monster films that you watched as you grew up, beginning with Lost World in 1925 and ending after the 70s. The movie doesn't disappoint, and except for a few minor points I could argue with, it gives you what it promises: monster battles, terror, and action. Good old monster mash fun. I give Kong: Skull Island 5 sheep.